How was your weekend? I managed to get sufficient rest, attend a baby shower, and afterward shop for some interior textiles in record time (snapshots likely to come later on Instagram or Twitter). It was glorious! It’s an in-between seasonal time, one that’s not exactly warm enough to forgo a jacket. Yet, there are days with moments of sun spurts that are more like trickery to the eye rather than a lasting indulgence in temperature change. Well, at least for now … So, this was a practical alternative outfit for the routes that I needed to take for a misty day—pairing a work blazer, and layering it with a vintage jumper and leather boots. This was a very easy ensemble that I wore to run errands: grocery shopping, and visiting the flower market. Fresh flowers were always in our home when I was a little girl, and it’s still one tradition that remains with me as an adult. Surprise, surprise, there was no scarf within reach; otherwise you can absolutely bet that there would have been a printed or vibrant version to accompany this outfit. The goods: Blazer-Zara, Grazia 60s mod vintage sweater-Fara charity shop, Boots-Franco Sarto, Denim-Express, Brooch-DIY, Bracelet-F21, Eel skin purse-Vintage. Lastly, you may have noticed a new home for the blog à www.fashiontalesblog.com. It has been long overdue, however I decided to renounce the older url some time ago, and now use my actual blog name instead. All other social media handles (@ladyofashion) will remain the same. Please update your blog lists to this new url. Thank you! What did you do this weekend? Anyone find an amazing deal, eat at a new restaurant, or go to a concert? *I am linking up this post with Elena from DC in Style. Check out other blogger's style here! I'm glad to hear you had a great weekend! And I love this look because it is both chic and comfy to be running errands! I agree about the weather. It's getting a lot warmer which is great, but I still need a cardigan here and there. Love the red and blue color combo and the new blog URL! Madison you look fab!! I love the red dashes and that umbrella is wow!! This is such a smart look! I love everything in your outfit! 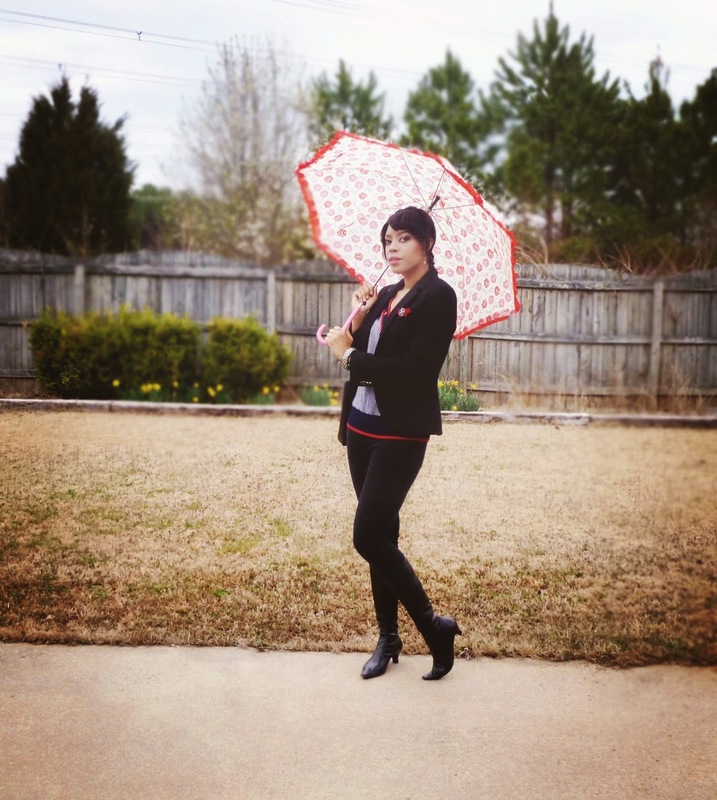 Love that last photo of you with the umbrella ;) What a cute color scheme! My weekend went by fast but it was nice. My husband and I finally got a second car (we've been making things work with one car for a little over a year now after his car was stolen). Very nice casual chic outfit! The umbrella is just too cute! Congrats on your new domain! Love the vintage feel of this look. Madison, you had a FUN weekend girl! I envy you! I love your outfit! That blazer and jumper look so good! And how pretty is your umbrella! I love the print and ruffles. So girly! This weather is tricky! You really have to know how to layer. We're back to chilly weather again. LOL Great outfit! Looks awesome on you! Lovely outfit and the umbrella is very pretty and so girly! Awesome look! I LOVE the vintage sweater. And that umbrella's a steal! Hopefully I could buy a cute umbrella too. I think it's practical and fashionable. Thanks for sharing! Ooh that umbrella print is too fun as is the vintage jumper. I love and miss layering. Congrats on the new URL! I love when an outfit is easy but so well put together it looks stylish. That's this outfit! What a gorgeous outfit for running errands in! I'm coveting your vintage jumper. I love that you're continuing the family tradition of always having flowers in the house - it's lovely. sounds like a perfect weekend! love that umbrella! its fab! and your outfit rocks! such a cute look! I love how put together you look- even for running errands! a really nice outfit for a cloudy day! Scarves are a must accessory for me, not so much for aesthetic as for practical reasons! And I have to add that I bought a fabric with the same lip pattern as your umbrella (in different colour and without the "Kiss") and I plan to make a dress out of it! i love this outfit. and that umbrella is the cutest! Yes now I see your new url!!! Cool I prefer it that way. You look adorable Madison. Simple but chic. Love the blazer and the cute vintage sweater. It's not easy to dress with the weather right now. Cold and then warm again... I wasn't at a concert but saw the new Veronica Mars movie. Happy Tuesday!! You look so pretty!!! I love your umbrella! You look so fab, Madison; I love that vintage sweater!! OoohooO! Shopping for textiles sounds like tons o' fun, actually. I love browsing prints and patterns galore. *___* It's like a candy shop. You look absolutely dashing in your classy red and black and blue ensemble, too! congrats on the new blog name! i would do the same but there's another blogger who has my name after i started my blog. boo. butttttt how much do i adore this outfit??? umbrella included too! Stylish inter-season outfit. I'm finding it so hard to transition this year from Winter to Spring. The weather isn't cooperating. You look great. And I agree with you about fresh flowers. OOh I think this is one of my very favorites of yours! All the little details really take it over the top to perfection :-) Though it's easy as you said, it's very chic - with a pinch of Britishness (not that that's a real word, haha) to it. My weekend was full to the max of bday parties and drama practices...I'm quite wipe now, hehe. very nice and simple outfit for errands! love your umbrella! A classic colour combo and so beautiful on you!! You look stunning,I want that jacket. Sounds like a fun weekend! I love the sweater, super charming! Thank you! :-) Yes, I understand your feeling, I started my blog name first too, there used to be one of the same name with "a" as a prefix, but it's not even active anymore so I am glad. Yes, all feeds should be okay, I updated that the same time that I switched domains. Yes, the blog feed should be good, so you will be able to still see the latest posts. Thanks for commenting Lu. Thank you Emmy! I love blazers/jackets very much, probably have more of them than anything in my wardrobe (other than scarves, haha). Haha, thanks Kim! I am such a fan of nice umbrellas/parasols, especially prints! Thanks Lilli! Enjoy your week as well. I agree, sometimes low-key is definitely needed and all I want as well. :-) Thanks Nnenna! Cla, Danke! Ich immer liebe Vintage mit die roten Kombination. Auch, Ich wünsche Dir einen schönen Abend. Ha, that's a bit of a stretch (considering I live in Australia) but would love to go to London someday, so I will definitely keep that in mind! Yes, a bit of a journey, lol. But, all things are possible ... you never know! :) Thanks! Great look Madison. That vintage sweater is just superb. Sounds like you had a very busy but fun weekend! Such a beautiful look! I so love that vintage sweater and your umbrella is adorable!